Male army haircuts just like classy up-dos for women will never go out of the fashion as they have special function. Just like office workers have dress code and strict rules about hairstyle, army has even severe rules about haircut and there are no discussions about changing the rules. So which are those army haircuts that are chosen by soldiers and not only? The best and most popular style of army haircut is still buzz cut that is very popular among celebs. Super short crop cut hair will set you free from styling steps. Just wash and go. Still such haircut is suitable only for those with proportionate scalp and facial features. If you are not sure about buzz cut hairstyle you can choose high and tight design where the crown area is left slightly longer than the sides and back. Flat-top is another variety of buzz cut but it is more funky and fashionable. Here the top is left a bit long while the nape and sides are totally shaved. 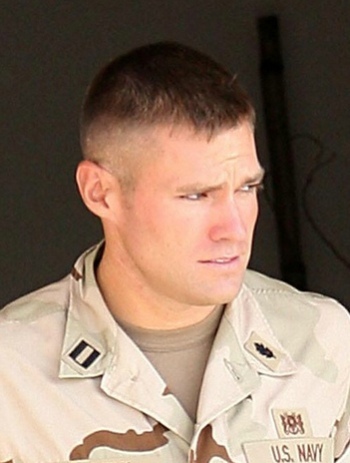 Those are the main styles of army haircuts that are popular nowadays. All of them look very stylish and hot. Go for army haircut if you like that masculine and bit brutal look.